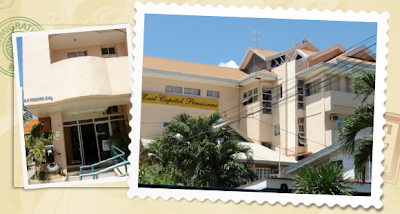 There are numerous hotels, inns and pension houses in Cebu. The challenge for us though is getting one that's clean, accessible and budget-friendly. Among our three considerations, the most important for me is the place's cleanliness (especially the bathroom!) so I've referred to reviews and blog posts to help me decide. In my search for our first accommodation (June 5 -6), I came across East Capitol Pensionne. Budget is definitely a check because they offer Standard Rooms for only Php 800.00 with free breakfast for one person. So the next thing I looked for was traveler reviews. I went to TripAdvisor (I pretty much think the reviews there are reliable) and I found few but generally okay reviews. I called them, asked a couple of questions then finally decided to book the place for a night. Upon arrival at the airport, we got in a cab and asked the driver to bring us to ECP. It's not along the main road but is still accessible for public transport. It's near the Cebu City Capitol and a McDonald's branch, and a few minutes away from Ayala Center. Cab fare from airport to ECP was Php 211.50. When we got off the taxi, Jhay was surprised that the place is quite small but the key is to manage expectations. We paid 800 bucks so I didn't expect too much -- just a decent place to leave our things in and sleep after a tiring city tour. But in fairness, the reception area is quaint and classy. We took our key and headed to our room located in the second floor. The door flung open and that's when we felt that we're on a budget accommodation. LOL. The room is really small. It had a single bed when I expected a double (my bad because I didn't notice the picture in their website). Good thing J & I snuggle tightly when asleep so we didn't mind having little space. The mattress is quite comfortable and the sheets are just okay. The bathroom is also cramped but it's clean so I'm satisfied. It has a heater, too, and the water pressure is strong (J enjoyed :D). The receptionists aren't the warmest but they are reliable. They assisted us with directions and during check-out, you won't have a hard time finding a cab because they have contacts. The only cons is that they serve breakfast at a fixed time - 7AM - so we weren't able to avail our free meal as we had to leave for Bantayan Island a little past 5 in the morning. Overall, I have to say that I got my money's worth. If you're a backpacker and would spend most pf the day going around the city, East Capitol Pensionne is a good choice. Cebu Getaway: See you again, Cebu!